Then Jesus, full of the Holy Spirit, returned from the Jordan River and was led by the Spirit in the wilderness, where for forty days he endured temptations from the devil. Yet Jesus himself frequently withdrew to the wilderness and prayed. I love those God-filled revelations that grab me when I read the scriptures. I had one of those recently when I read Luke’s gospel, chapters 4 and 5. Like most readers who are familiar with the gospel writings, I was aware that the Judean wilderness was the place where, for 40 days, Satan continually tested Jesus’ commitment to please God. (I think that it is almost ironic that Jesus’ commitment to please God is tested right on the heels of God’s very public declaration that he was “well pleased” with Jesus.) However, when I read Luke 5:16, the Holy Spirit opened my eyes to the fact that although the wilderness was the place where Jesus encountered his greatest testing, YET JESUS OFTEN CHOSE TO RETREAT TO THE WILDERNESS TO PRAY. Such a wild, barren place of prayer is quite a contrast to what I would choose for myself if I were given an opportunity to choose the perfect outdoor spot to pray. I would most likely choose a relatively quiet place with a great view — maybe my front porch or rear deck or nearby lake — maybe a soft spot on a grassy hill in a park — maybe a colorful outdoor garden with butterflies and flowers in bloom — or better yet, an ocean beach (with clean sand) or a scented path in the woods teeming with life (but not too much life) — You get the picture. Such a place, as I reason it, is the “perfect” place to encounter God and bask in his presence as I pour out my heart to him. I definitely would not seek out a desert place of rocks and wild animals, a place offering no physical comfort, little sensory pleasure, and few life-sustaining resources such as water. Yet Jesus regularly prayed in such a physically hostile place. 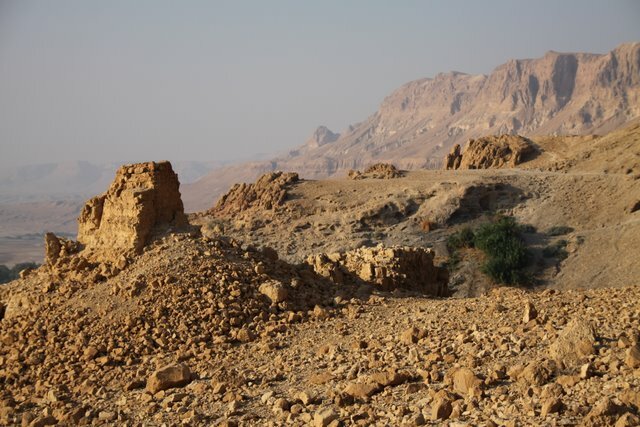 In the photo above is a picture of the Judean wilderness, a wild, barren region in Israel and the West Bank, lying between the Dead Sea and the Hebron Mountains. It is marked by terraces with steep slopes and is crossed by numerous valleys and ravines which range from 600 to 1200 feet deep. Also, Mark writes that there were wild animals there. I believe that Jesus chose to resort again and again to the desert because for him, it had been transformed from a hostile place of testing to a personal place of victory. It had been transformed from an environment that threatened his physical survival to a place where heaven, once again, opened for him — as it did at his baptism — releasing a powerful host of angels who descended to earth to attend to his every physical need and to refresh his weary soul exhausted by battle. For Jesus, the wilderness had been transformed into a sanctuary. Like Jesus, I believe that we can transform our wilderness into our sanctuary and that the transforming agents in this process are THE WORD OF GOD and PRAYER. The Word of God as an agent of transformation is not about our memorizing and quoting scripture verses or passages – Satan can do that – but about abiding in, living in, and obeying God’s word. We must remember Jesus’ response to Satan’s taunting to turn the wilderness stones into bread: “Man does not live by bread alone but by every word that comes from the mouth of God” (Matthew 4:4). The point is that we must live out our everyday lives in obedience to God’s words and commands as taught by Jesus. It is this lifestyle of obedience that builds a solid foundation for our spiritual survival in life’s storms. It is this foundation built by investing our heart, mind, soul, and strength in our relationship with Jesus that will sustain us when Satan, our enemy, launches an all-out offensive on our faith. We can emerge victorious from our wilderness experience because we have been “eating” Jesus, feeding off of our love-relationship with him, and living our lives through him as he pours his life (word) into us. In prayer, we do not just COMMUNICATE with God but we also COMMUNE with God. In prayer, we enter into a time and place of intimacy with God where we pour out our hearts to him and he deposits himself into us. In prayer, we learn to abide and rest patiently and confidently in God’s word. In prayer, God gives us the strength to faithfully trust in him. In prayer, God will impart to us, by virtue of our faith in Jesus Christ, a special grace to overcome the world, the flesh, and the devil through the power of the Holy Spirit who is our Helper and Comforter. Finally, we can be confident that the wilderness is a place where the Holy Spirit will LEAD us but never LEAVE us. It is a place where God will TEACH us but never TAUNT us. We must understand that we are in the wilderness by God’s design. Through our wilderness experience, God will demonstrate to the world not only what it means to have God WITH us but also what it means to have God IN us. I really appreciated your thoughts. Wilderness experiences are like mile markers to a long distance runner. The mile markers are reference points that tell how far you have come and still how far one needs to go, to reach the finish. After the race, recalling the running experience, one gage their performance, mile by mile. So true, JG. I like your comment about wilderness experiences as references points. I, too, believe that God uses these reference points to help us assess how well we are growing as followers of Jesus Christ as we are running our race. Also, I believe God uses our wilderness experiences to reveal himself to us. So, difficult as they are, these experiences are critical to our spiritual growth and development.